This very rare and beautiful jersey was worn by forward Gareth Reinecke during the 2002 men's Division II World Championships in South Africa. He played 4 games and didn't dress for one game. The games were against Israel (L 2-4), Turkey (W 7-0), Estonia (L 0-15), Belgium (L 0-10) and Australia (L 4-8). With the win over Turkey, SA finished 5th and avoided the qualifications for 2003 Division II WC. Reinecke represented South African men's national team for the first time in 1999 Pool D WC when he was only 17 years old. During his career he represented the U-20 NT two times in 2000 Pool D and 2001 Division III WC and men's NT in 6 WC tournaments the last being the 2007 Division III WC in Dundalk, Ireland. In 2007 he scored very respectable 3 goals and 9 points in 4 games and took 20 penalty minutes. He scored one goal against Israel, 2 against Australia and got one assist against Turkey. The jersey has light wear on the front side. The numbers and crests are heat pressed. The IIHF patch and nameplate are sewn. The individual letters are heat pressed. They jersey is made by SP. 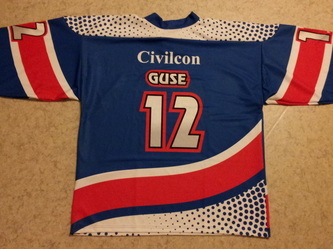 The jersey was obtained from a member of South African ice hockey federation. 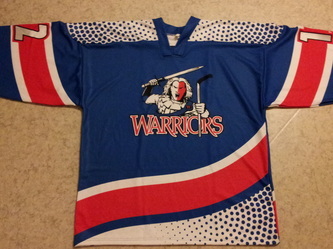 The blue jersey is a fan jersey of the local club team Pretoria Warriors. Everything is sublimated on it.